As promised Pitaya Matcha Marshmallow Coconut Cups in time for spring (and Easter), because depending on where you live it isn’t looking much like spring. If you follow me on Instagram you or have seen one of my recent posts I’m pretty obsessed with coconut cups again. Making twists and variations of the Vanilla Bean Coconut Butter Vanilla Almond Butter Cups I shared almost 4 years ago. Which ironically I made for an Easter treat and everyone loved. Twists like these pretty in pink Pitaya Coconut Peanut Butter Cups that can be filled with any nut or seed butter you want. Peanut butter, almond butter, chocolate hazelnut butter, a seed butter, the options are endless. With other variations like these Mint Matcha Chocolate Coconut Cups and I posted on Instagram adding a mint twist, filling them with chocolate hazelnut butter or chocolate tahini, and topping them with chocolate covered chia seeds. Or these Matcha Marshmallow Coconut Cups. Posting quick recipes there after sharing on Instagram Stories and getting requests for recipes. 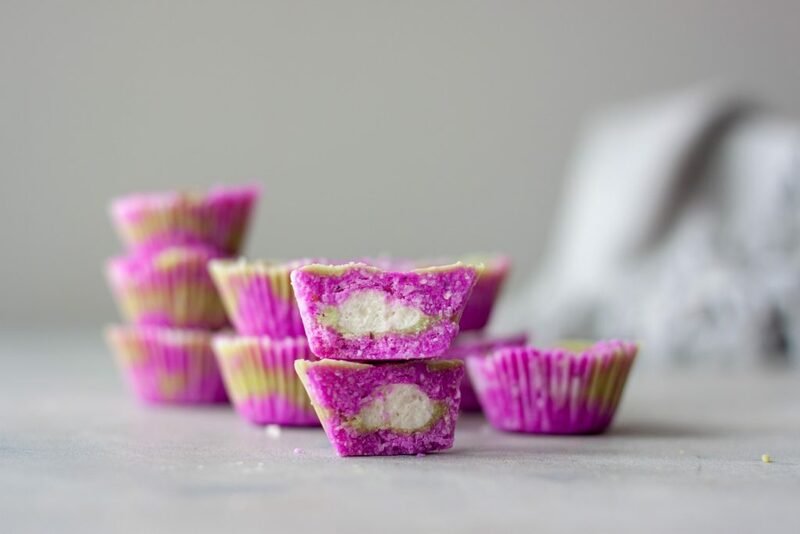 I shared a sneak of these Pitaya Matcha Marshmallow Coconut Cups on Stories and in my post for No Bake Bird Nest Cookies (a fun favorite on classic chocolate haystack or bird nest cookies but without Chinese noodles or jelly beans) last week. I’ve already sent this recipe to a few who asked and now finally today sharing this twist on all of them with pitaya, matcha, and marshmallows but if you want you can sub nut butter. Customized treats that are perfect for any Easter basket, or just a spring snack. Simple to make and great to have on hand for a healthy filling afternoon treat when hunger and cravings set in if you’re like me. Grabbing one of these keeps me satisfied and full until dinner. I also get hungry and cravings set in late at night when I’m up working and usually I opt for chocolate or popcorn but these have less sugar than chocolate and again the healthy filling fats, and less salt than popcorn which lately has me drinking a lot more water for bed and sometimes leaves me not feeling the best in the morning. If you are looking for a low carb, low sugar snack feel free as I said to sub in nut butter like the other options linked above. If you have brain octane or MCT oil you can add that to these, which I do if making a batch for myself but not when I’m making them for others or the girls, I stick to coconut oil. Speaking of the girls… A and I are whipping up another fun treat that is kind of a twist on these but no cups required and a few more toppings for hers, I have a feeling she’ll breakout the sprinkles, but I’ve got toasted coconut on my mind for mine. It might get a little messy but it will be fun! I’ll be sharing over on Instagram this week! As I mentioned on Monday we’re headed up north this week and will be spending Easter with my parents. We’ll be making sourdough up there not only because Sunday is National Sourdough Bread Day but also because it’s what we do. We attempted to make sourdough bunny rolls but as you can see below that didn’t work out so well. I thought it would be funny and perfect with Easter, National Sourdough Bread Day, and April Fools all falling on the same day. First attempt… what are these things? These worked much better but when they rise they puff and twist and when they bake some of the tails popped off! What did work out though is this Cinnamon Swirl Sourdough Twist we baked in a cast iron pan. I couldn’t believe how beautifully it turned out and how well my husband was able to execute my vision. I was going to add in some raspberry chia jam or something special but there was something so special about the simpleness of it and just pulling off a chunk and topping with anything or nothing (I added a vanilla yogurt cheese made of just strained Vanilla Kite Hill Greek Style Almond Milk Yogurt, and homemade chia jam, you can check it out over on Instagram). We are having an Easter dinner on Saturday with my brother and his family but I’m sure my mom will make her caramel rolls Sunday morning for Easter. The girls always request them and she makes them and has always made them on Easter for as long as I can remember. What are you doing this weekend? If you celebrate Easter do you have any food traditions you make? 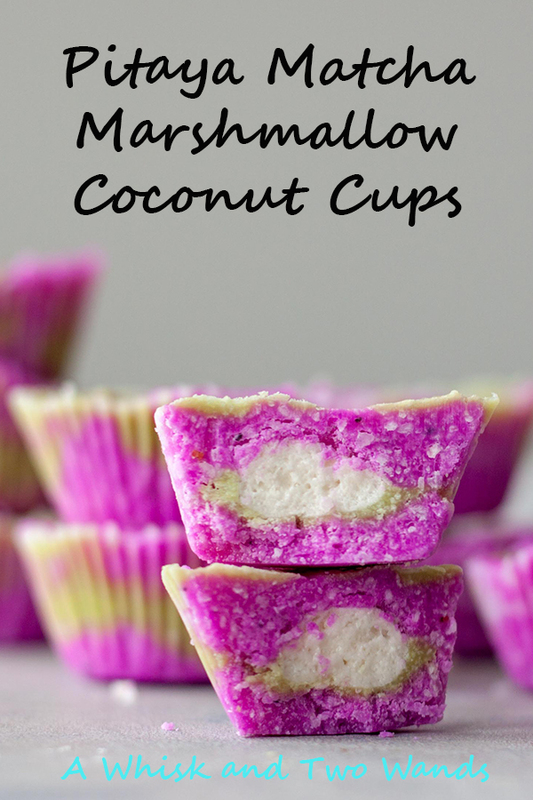 Pitaya Matcha Marshmallow Coconut Cups are simple delicious treat that's healthy and fun! Packed with healthy fats and fiber, low in sugar and carbs, they are gluten free, vegan, and paleo friendly. Fill a mini muffin tin with 12 paper liners. If you have a silicone mold you can omit the papers. I find it easiest to cut the marshmallows with a kitchen scissors, or frozen with a knife. (We keep out opened Dandies in the freezer to maintain freshness) Cut marshmallows into 3rds or half depending on how much marshmallow you want in your cups. In a Vitamix or food processor process the coconut until it is creamy, scrape the sides of the bowl as necessary. It will take longer in a food processor but doable you just need to scrap down the sides. Once it’s smooth scrape the sides and bottom to make sure you have all the chunks out and process for another 1-2 minutes. Stream in coconut oil and optional sweetener, blend until just combine. Depending on the sweetener and how much some separation will occur, this is ok and your cups will still work. Separate the coconut butter into 2 bowls and add pitaya to one and matcha to the other. Fill each cup 1/4 of the way up with a little of each of the coconut butters (about 1 teaspoon total per cup). If the mixture isn't smooth and pourable you will have to take pieces and press it into the cups. Add a marshmallow to the middle of each cup, pressing lightly but you don't want to push it through to the bottom. Top with coconut butters to cover. Tap pan on the counter to remove bubbles. Place in the refrigerator for 10 minutes to set, or until ready to enjoy. Store remaining cups in an airtight container in the refrigerator. MCT or brain octane oil can be used in place of coconut oil if desired. Add in additional tablespoon of oil if needed, recently had some batches of coconut (which I haven't had in a long time) that required a little extra. OMG are these not the most gorgeous things I have ever seen on the Internet! But seriously!!! I am above and beyond impressed but then again, you never cease to amaze me with your recipes that seriously MAKE ME DROOL all the friggin’ time! You are on FIRE! This recipe is like the epitome of Spring and Easter fun! Your girls are two lucky ladies! These are soooo pretty!! I don’t even care how they taste, I just want to look at them…actually, I take that back..look a them and THEN EAT THEM ALL. SO GOOD! Thanks for the recipe. I’ve never tried Pitaya before so this is a must try now! I just made mini cups, but yours are far more healthy! And those puffy bunnies are adorable – I bet they taste great, too. This color is insane! And matcha is one of my favorite ingredients. Love how bright and cheery this dessert sounds!